The official Twitter for Android app isn't simply the best overall Twitter experience on the platform—it's a peek at the future of Twitter on every smartphone. From the second you open the app, it's the most polished Twitter experience on Android, by about ten thousand light years. High quality graphics, a true sense of design and purpose, an animated background with a fluttering bird as trending Twitter topics come in. Smooth, swooshing animations bridge nearly every action. It just feels slick in a way no Twitter application even come close to on Android, a depressing fact given the OS has been around for like 18 months. Some might say it's cartoony, but it perfectly matches the overall Twitter aesthetic, and feels so much lighter than anything else on Android (even the good stuff). The subtext here is clear: Twitter wants to deliver the defining Twitter experience on every smartphone. They built this app with the Android team, much like they worked with BlackBerry—and they bought Tweetie on the iPhone. What's illuminating is how the official apps differ from OS to OS. With BlackBerry, the app's "nativeness" is an overtly an interface thing—just compare it to the official BlackBerry Facebook app, and you can sense the shared DNA. 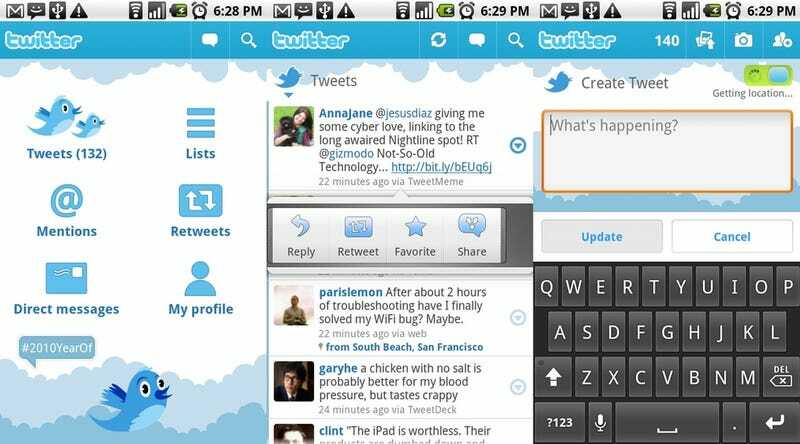 With Twitter for Android, the interface is obviously more of an expression of how Twitter thinks a Twitter app is supposed to look and feel. It doesn't appear or behave like any other Android app (though perhaps that's the defining characteristic of every Android experience), but like a Twitter app. What makes it feel absolutely like a part of Android is how naturally and deeply it's integrated. Twitter syncs to your contacts, so when you pull up somebody's contact card, it shows their latest Twitter update, and can take you directly to their Twitter profile—which supports the standard Android 2.0-style headshot thumbnail, so when you click it, all of the ways you can contact that person pop up, completing the loop. As definitive as it is, Twitter's not perfect, with its very Twitterness being the greatest source of its 1.0 weaknesses, in that it doesn't massively leapfrog Twitter's own core functionalities: It doesn't support multiple accounts; the conversation view is sorely lacking (it only shows one tweet at a time, not the actual conversation); and by hewing closer to Twitter's UI conventions, it occasionally clashes with Android's, resulting in confusion. For instance, it very rarely relies on the menu button to tuck in features—which many Android apps do—preferring to make as much of the interface appear onscreen as possible. So when it does hide a feature behind the menu button, it's actually more confusing. It also needs different font size options (if Android had better fonts that'd help too), and I'd really like a great push notification setup for @mentions, rather than having to set up a battery-killing refresh poll frequency. Update: Oh yeah, support only for uneditable, native retweets is another serious pain owing to its strict Twitterness.